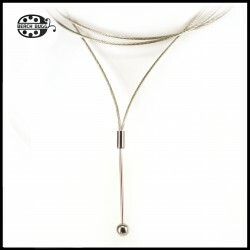 Surgical steel Omega chain necklace with surgical steel screw clasp chain diameter:1.4 mm For beads from 2mm hole diameter. If you choice custom length, please leave a message about your request. PLEASE CHOICE THE NECKLACE LENGTH! 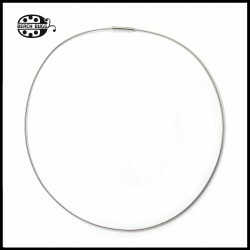 Belly stainless steel necklace for 2 beads thread size: M1.1 ATTENTION: This model was changed on 5. May 2018. This necklace do not have a clasp. 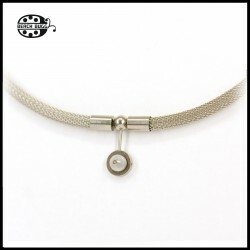 You can move up and down the middle oval stainless steel beads. 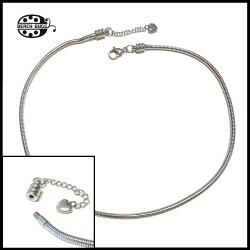 For bead with 3mm hole. Snake chain have 1.6 diameter.PLEASE USE PLIER ON PARTS! WITHOUT GLASS BEAD! 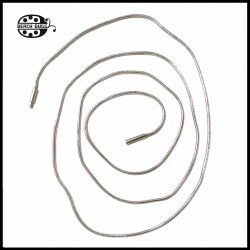 Surgical steel snake chain necklace with surgical steel bayonet clasp chain diameter:1.5mm For beads from 2mm hole diameter. Length: 70cm, 80 cm, 90 cm or custom length. If you choice custom length, please leave a message about your request. PLEASE CHOICE THE NECKLACE LENGTH!